Tehe, get it? "Spud-ow"? Potato go boom. Holy crap, am I actually reviewing a game? Who expected it as my first one? You? Yes? Nah. Well, in any case, I’ve taken quite a turn from the usual MMORPG’s and gone into a tower defense mode lately. One of the actual notable games which I’ve actually dropped dollars on was…you guessed it! 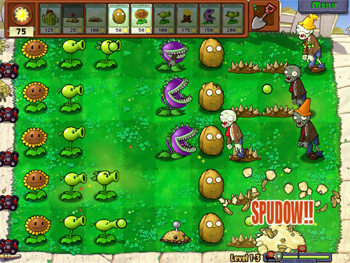 Popcap’s Plants vs Zombies. A horrific tale where there are slow and stupid zombies rushing your home at all hours of the day! What are you to do so you can stay safe!? Why, gardening of course. Why anyone would ever hint to get some guns and blockades is beyond me. You know what? 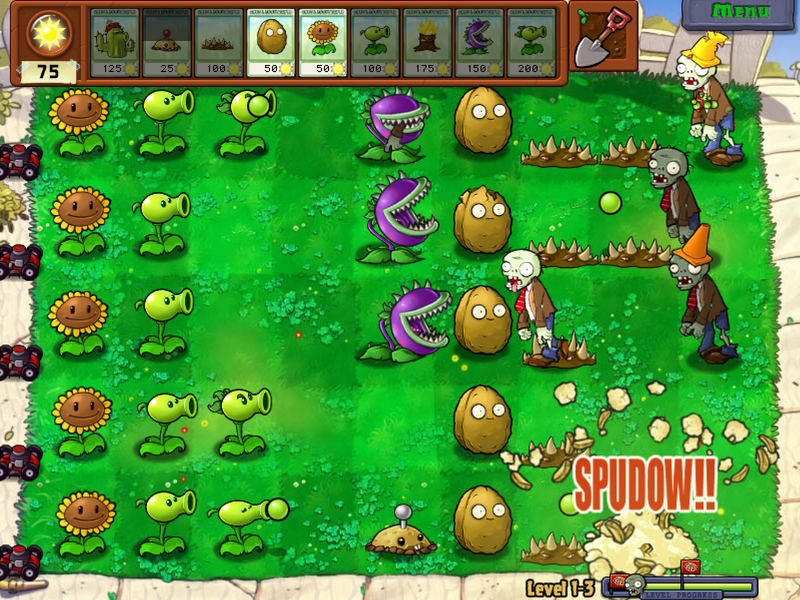 Let’s throw that guy out the window and while the zombies chomp on him, the plants can do the dirty work and mow the zombies down. Heehee. Get it? Plants mowing something else? Cause…they are usually at the other…aah you don’t know funny. Moving on! The game is certainly different than what I was expecting out of a tower defense game. Admittedly, going into it and seeing the tower setup first thing, I was thinking it was the worst $10 I had spent on a game since…well it’s been awhile since I’ve bought a $10 game so cut me some slack. I’m not sure if the bugger was on sale, but off of Popcap’s site, it’s going for 20, but I got it off of Steam so ha. Because this is me pretending to be a crafty consumer. Now as of roughly 16 hours ago, I would have said that while the game is indeed fun, that it was not worth the $10 that I paid for it. However, I decided to take another peek into the game and it seems the story mode does have a bit of replay value (also, because I needed a screenshot). Thus burning many more hours if you’re truly looking to see the end. The mini games are pretty fun as well. My personal favorite being a Bejeweled spin on the grid of plants. Does it get tedious to snag every bit of information out of the game? Uhm…yes. A lot of time is involved for a minimal return in my opinion. But at it’s apex before you start getting into a money grind to get every single bonus you can possibly get, it’s a wonderful game! What does the Shu give it? A freaking 8 explosions! This entry was posted on January 27, 2010, 12:27 am and is filed under Games. You can follow any responses to this entry through RSS 2.0. You can leave a response, or trackback from your own site.